The dream for many trainers is to be based at a top-class state-of-the-art training centre with wonderful gallops, leading rehabilitation facilities, top-class staff accommodation as well as an ambitious site owner prepared to establish the facility as the very best of the best. For nine Hong Kong-based trainers, that dream has come true. In August 2018, an eight-year project conceived by the Hong Kong Jockey Club (HKJC) came to fruition with the opening of its Conghua racecourse and training centre in China. There is the slight downside for Sha Tin-based trainers, as the centre is a four-hour drive away from their main Hong Kong stables—across the border and in China. But every possible negative that it might have caused has been mitigated by the HKJC through discussion, cooperation with the Chinese authorities, big-planning, alongside the focused use of technology and ambitious ideas. Nine trainers were invited to send horses to Conghua last autumn, and each has a string of between 15 to 20 horses based at the 150-hectare site—the trainers now termed ‘dual-site trainers’. Currently around 150 horses are in training at the €377 million facility, although by December 2018 the number of horses who had shipped to Conghua, returned to Sha Tin and travelled to China had already exceed 500 individuals. The trainers were fully involved with the design and planning of Conghua from outset; the racecourse and gallops are in fact a replica of Sha Tin. Ensuring that the daily work and training processes are exactly the same, methods honed in Hong Kong can merely be picked up and transferred to China. There is though, at the trainers’ request, an additional 5f uphill straight gallop. Selected trainers were invited to trial the Chinese venture and were chosen on their own abilities and that of their staff. The HKJC wanted to ensure that stable staff sent to China were capable and experienced. The nine trainers with horses on site include leading trainers John Size, John Moore, Danny Shum, Casper Fownes and Tony Cruz. All have been successful back in Hong Kong with their Conghua-trained horses (which are identified as such in the media for the betting public); and the Sha Tin nine are kept fully abreast of the training at Conghua courtesy of video, timing facilities and real-time technology all provided by the HKJC. The trainers, however, can spend as much time as they wish in China. 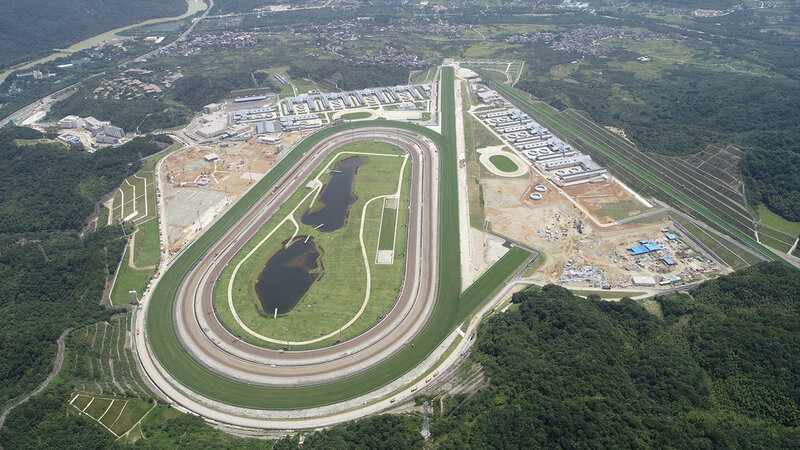 CRC will serve as a world-class facility for the training of Hong Kong's racehorses. Spelling paddocks for relaxation and rehabilitation. The 1,100m uphill gallop is the first of its kind for the Hong Kong horse population. The equine swimming pool has a depth of 2.6m. “John Size and Danny Shum in particular have spent a lot of time at Conghua”, reports Andrew Harding, the HKJC’s executive director of racing. “We have had applications from other trainers to send horses, and we will be adding another two later in the year”. The success of the training process has kicked into gear quicker than even the ambitious HKJC team planned, and the site has already lost its initial ‘pre’ training tag. “We had thought trainers would take horses back to Hong Kong two or three weeks ahead of a race, but they are travelling down and running just two days later—and winning”, smiles Harding. “We thought this would take perhaps a year to phase in, but it has come much quicker. The HKJC provides all the transportation, and we are already needing to ramp up the logistics—the transport initially between the two sites was twice a week, but we have extended it to six days a week (much earlier than anticipated). The travelling process had also been taking five business days to process with the levels of administration required for the border crossing, but our dual site trainers said that was too long. We have already narrowed that down to two days. Trainers can now ship on Monday in order to race on Wednesday at Happy Valley, and the horses need to undergo certain veterinary examinations ahead of racing; so they have to be in Hong Kong two days ahead of racing. They can then return to Conghua on Friday. The transport costs are all part of the HKJC’s service, and owners do not see any extra expense”.